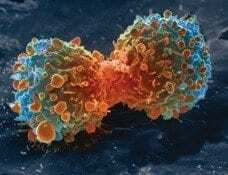 Cancer cells break down sugars and produce the metabolic acid lactate at a much higher rate than normal cells. This phenomenon provides a telltale sign that cancer is present, via diagnostics such as PET scans, and possibly offers an avenue for novel cancer therapies. Now a team of Chilean researchers at The Centro de Estudios Científicos (CECs), with the collaboration of Carnegie’s Wolf Frommer, has devised a molecular sensor that can detect levels of lactate in individual cells in real time.